So I was tooling around one day in the lab, reading Ivan Ristic’s book on SSL/TLS, when I came across his advice on securing Windows-based Infrastructures from offering up the use of out-of-date/obsolete or otherwise insecure cipher suites to hosts on the other end of an https connection. I read Ristic’s chapter a couple of times, reviewed TechNet, and selected a set of cipher suites in Group Policy in the order I wanted them used, based largely on Ristic’s text, but with a few others I knew I’d need after the policy went live. Then I pushed out the new policy, named “Strong Crypto,” to all physical, virtual and laptops in my home lab. A few gpupdates later, I was pleased to see that nothing was broken. Schannel wasn’t showing any errors, User & Computer accounts were authenticating and getting kerb tickets, and pleasantly, my Outlook fat client didn’t even hiccup; it happily was using TLS 1.2 cipher suites to talk with my Office 365 Exchange instance. And then, two days later, I noticed it. OneDrive for Business was busted, had gone Pear Shaped, and was now totally t***-up as my English friends would say. I’ll get to that in a moment, but first: why would you bother with something as obscure as cipher suites and their order? I mean beyond the fact that toggling the cipher suite sounds cool? Cipher suites are a critical part of your AD infrastructure. They’re critical as they represent a sort of baseline set of standards that client & server negotiate over during the complicated and very important tête à tête that is the TLS/SSL handshake between client/server. 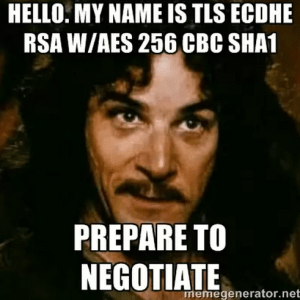 You can and should read more about TLS handshakes in this RFC, but the bottom line is this: client & server are supposed to negotiate with each other, find the most secure and common set of cipher package, and use it during the secured session. If client & server can’t find at least one common cipher suite, you have a busted TLS connection. And that’s no bueno, unless it was your intent. Don’t be intimidated by all the crypto terms on this screen. 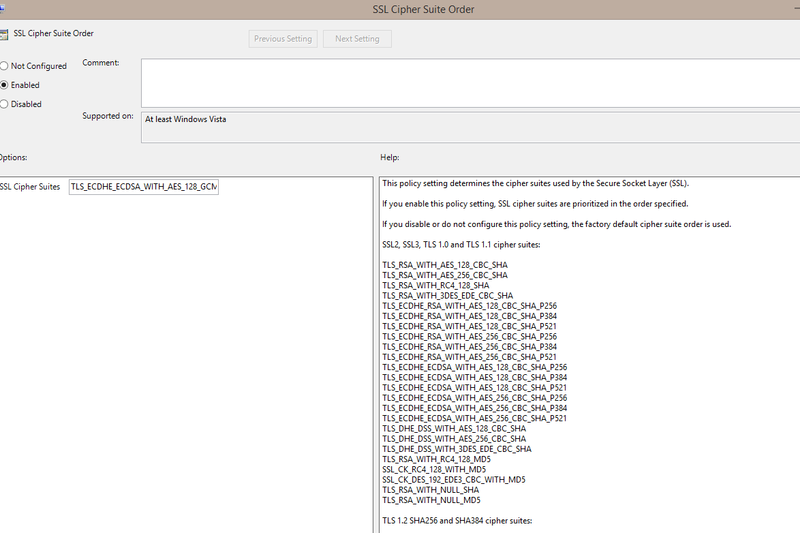 What you see is the list of cipher suites -and the order in which they are presented to a host- by default. 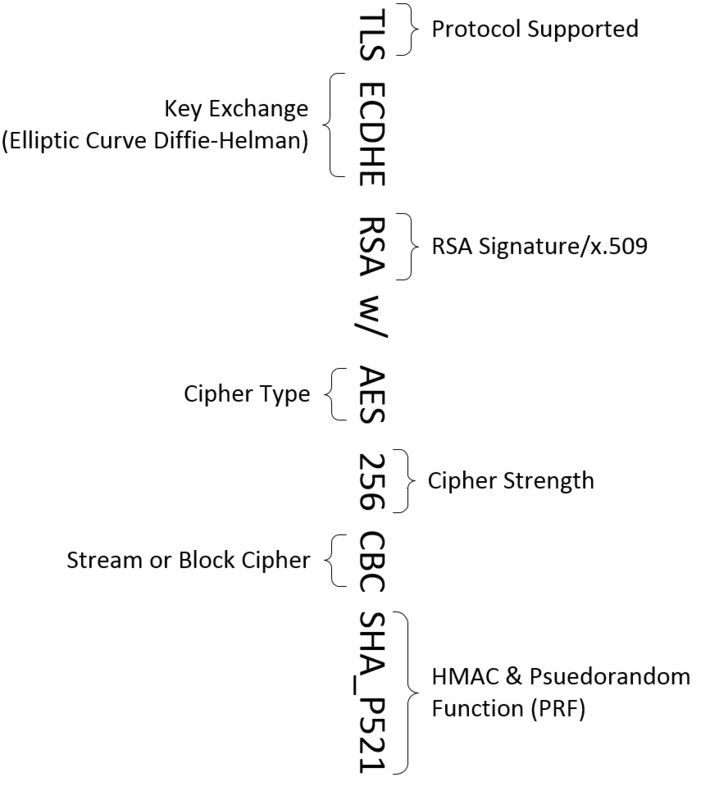 So, the Cipher suite above uses TLS as its protocol (vs SSL), can exchange keys via the Elliptic Curve Diffie Helman ephemeral mechanism, accepts an RSA x.509 certificate, and is willing to encrypt the session via the AES 256 bit block cipher. The last bit, we’ll get to in a moment. If your’e in a typical Microsoft IT shop, you probably have a few legacy applications hanging around that may rely on old cipher suites, or vice-versa, the application server can’t use the newer cipher suites that come built into your desktops & laptops. Take Windows Server 2003, for example. The base OS doesn’t support Elliptic Curve Diffie Helman for Key Exchange, so right off the bat, if you’ve got 2003 Hosts serving up https Sharepoint or Exchange in-house, your clients & servers will never utilize TLS_ECDHE as that suite is not common to both of them. The contrary is also true; your Windows 8.1 laptop isn’t going to support the oldest suites that your 2003 server does; TLS_RSA_WITH_DES_CBC_SHA is never going to be the cipher suite watering hole your clients/servers meet around ((thank Goodness!!)) unless you go out of your way to make it happen. The lesson here is that old cipher suites never die, dependency on them just fades away as your modernize/replace your legacy in-house applications with modern, streamlined, and properly TLS-secured ones. So be cautious, lest you break a legacy application. You might be thinking I’m full of great advice, yet I still managed to wreck my OneDrive for Business sync app. And you’d be right! Essentially, I broke my little OneDrive for Business sync app because I didn’t include SHA1 as possible hash algorithm in any of the cipher suites I selected. 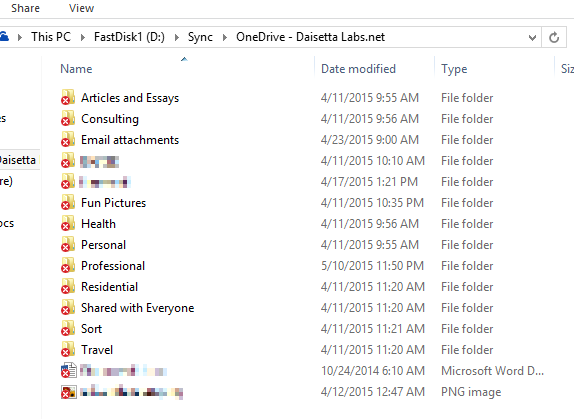 By leaving SHA1 out of my cipher suites, OneDrive for Business couldn’t find common ground with Sharepoint Online, which broke my OneDrive Sync. And SHA1 is used by Microsoft IT ((as a side note, it’s really awesome to see Microsoft IT’s PKI, built out as it should be. Here’s a PKI serving not just Microsoft internal employees -all 100k of them- but millions of customers. If Microsoft IT can build a PKI to that scale, surely you and I can build one for the users dependent on us!)) 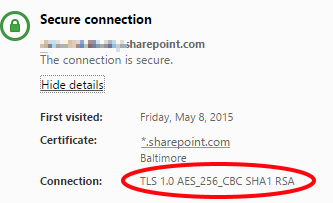 in at least two places: as the Signature Hash algorithm on the root certificate of my Sharepoint site, and as the hashing mechanism for the Thumbprint on *.sharepoint.com certificate. Had I visited my Sharepoint site in IE, I would likely have seen an error message in my browser; but I use Opera normally, and Opera -like Chrome & Firefox- have cipher suites apart from Windows’ so I never saw an error.